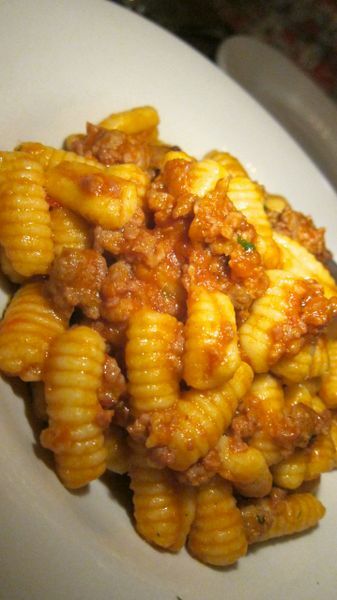 Sardinian “maloreddus alla campidanese” with sausage in a spicy tomato sauce. Frankly, I wasn’t expecting fireworks from Arco Cafe way up north on Amsterdam in Manhattan Valley. I had no expectations at all. The truth is that for all my travels in Italy, I know nothing about Sardinian food. Then, sipping a pleasant-enough rosé on a warm evening, with half a dozen soup bowls of pasta lined up on a narrow table for our seven Ethnic adventurers, I fell for spinach-green-ricotta cavatelli with shrimp and pancetta and “traditional” Maloreddos Campidanese, with sausage in a spicy tomato sauce. 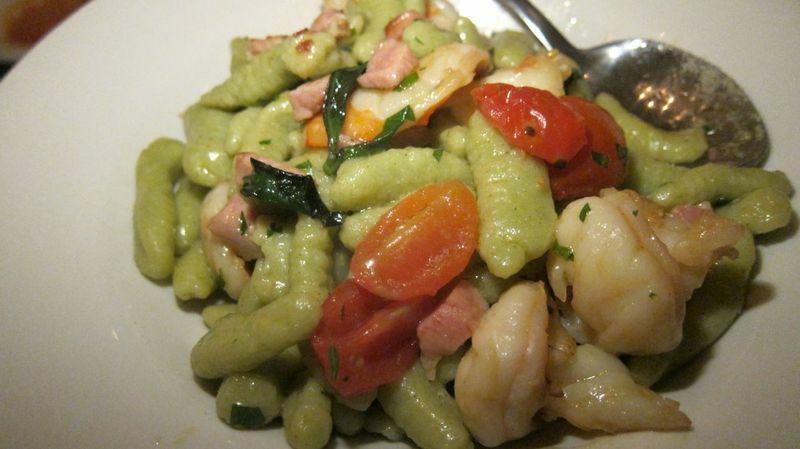 The evening special pasta, ricotta-spinach cavatelli tossed with shrimp and pancetta. It’s the spice in a restaurant critic’s life -- to wander into some unsung spot and fall in love. Or shall we say, instant like. I am sure the Times’ Pete Wells felt that same frisson of excitement when he first discovered The Simone on the Upper East Side. He gave it three stars Wednesday. I’d never heard of it, nor had anyone of my UES pals known for wailing they have nowhere to eat. The glass front looks New York but the pastas and the chef-manager trio have a rustic island air. I’d never heard of the owner here either, Sebastiano Cappitta, or his other value ventures in this area, the pizzerias Isola and Buca. But the bare brick, the bar, and the all-glass façade open to the street felt welcoming on a warm spring evening. Mature foursomes settle outside with an air of proprietary expectation. 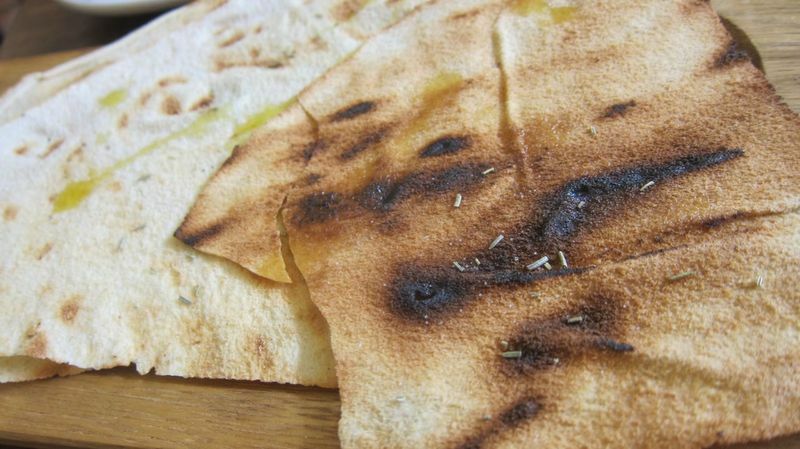 Pane Guttiau are toasted crisps with scant patches of olive oil at $3.50 per platter. We were seven, some lackadaisical, others with varying opinions. I suggested each of us order an appetizer, sharing tastes, and then get five or six pastas for the table. Amazingly, we all came to agree on that chilled Sardinian rosé. Then began a modest seduction, a little slow, requiring a second bottle. I liked the Sardinian pane guttiau -- toasted crisps with patches of olive oil delivered on wooden palettes hanging off the edge of our crowded table. 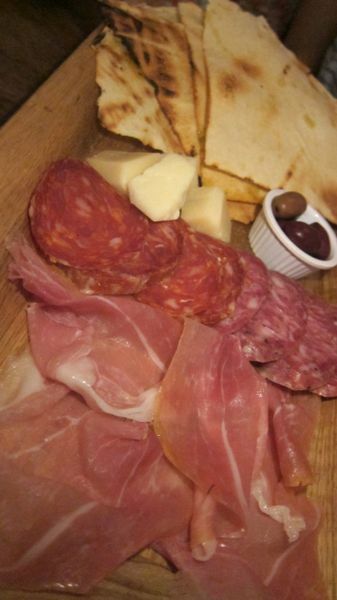 A $15 salumi-fromaggio board provides tastes for everyone. I especially like the spicy sopressata. Alas, the antipasti were uneven. We feasted on the generous salumi-cheese board with spicy sopressata, prosciutto and cacciatorini and we traded tastes of the zuppetta with its plump, fresh, perfectly cooked mussels in a light tomato bath. For me the spicy tomato sauce on tender little baby octopus seemed a bit murky (no one else complained) and my fritto misto of calamari rings and zucchini ribbons was soggy. That didn’t stop me or anyone nearby from sharing it. 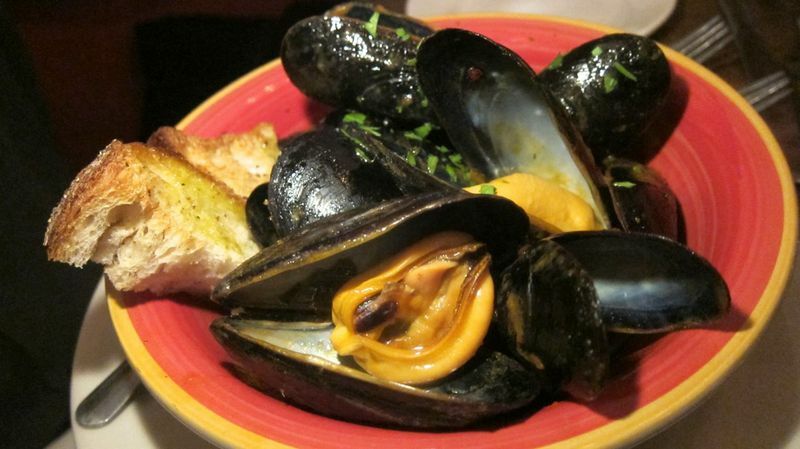 Fat, fresh mussels sit in a spicy tomato and Vermentino wine stew. 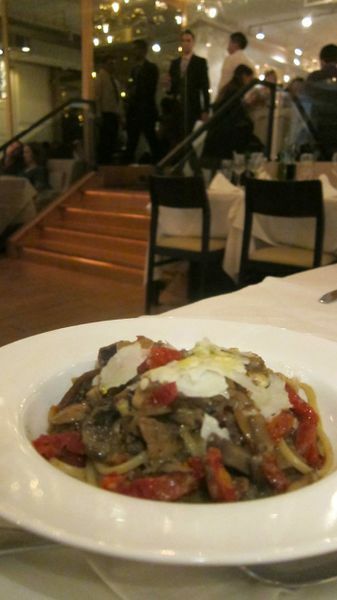 Then there were those Manhattan Valley prices to love -- pastas starting at $12, nothing on the menu more than $18. 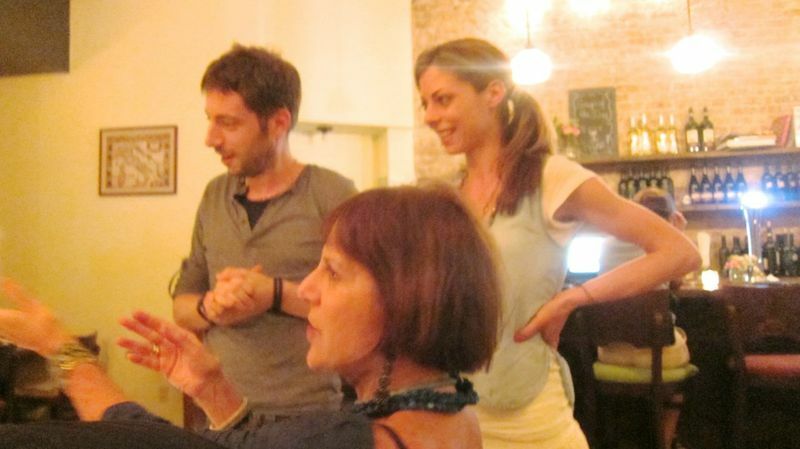 And there was Francesca, the stunning young woman sharing host duties with brother Daniele. They could be a travel poster for their homeland. Francesca Fiori can be a blur racing through the room from the terrace to the kitchen. 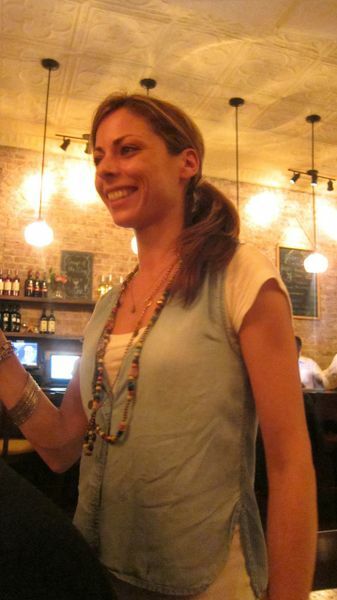 She guided us through Chef Giovanni Tenace’s menu, making sure we didn’t fall for everyday tagliorini cacio e pepe or a chicken paillard rather than the rustic lumps and dumplings of Sardinia with their strange and unpronounceable names.Then she raced between the sidewalk tables, newcomers at the door, and the kitchen, sometimes a blur, personally fetching more pane crisps for our crew. 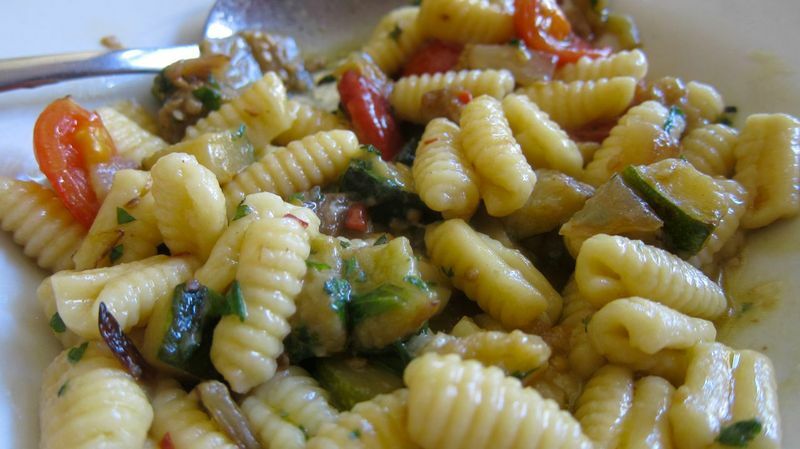 Maloreddus aka Sardinian gnochetti are tossed with mixed vegetables in garlic olive oil. So yes, the listing is written in dialect. But still…why should Gnochetti Sardi alla Crudaiola (with mixed vegetables in garlicky olive oil) be the same rolled pasta as Maloreddos Alla Campidanese (with sausage in spicy tomato sauce.) And of course, we’ll have ricotta cavatelli with broccoli rabe and spinach-ricotta cavatelli with shrimp and pancetta. Never mind if it sounds redundant. Just listen to Francesca. The luscious semifreddo is made with Sardinian ameretti cookies. She doesn’t ask if we want dessert. 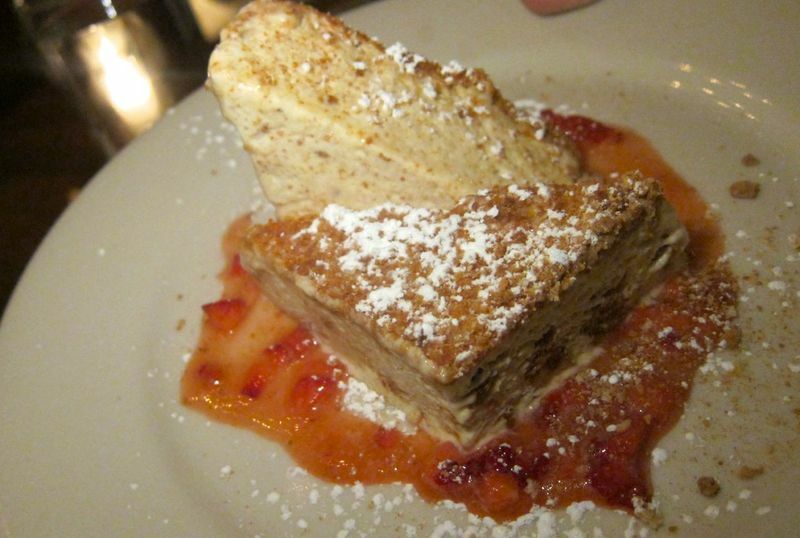 She instructs the waitress to bring it, gift of the house: lemon olive oil cake with strawberry sauce, a melting chocolate soufflé cake, and semifreddo of Sardinian ameretti. The last provokes tempered desire from our normally disciplined stalwart. Was dinner as good as it seemed? I ask myself. 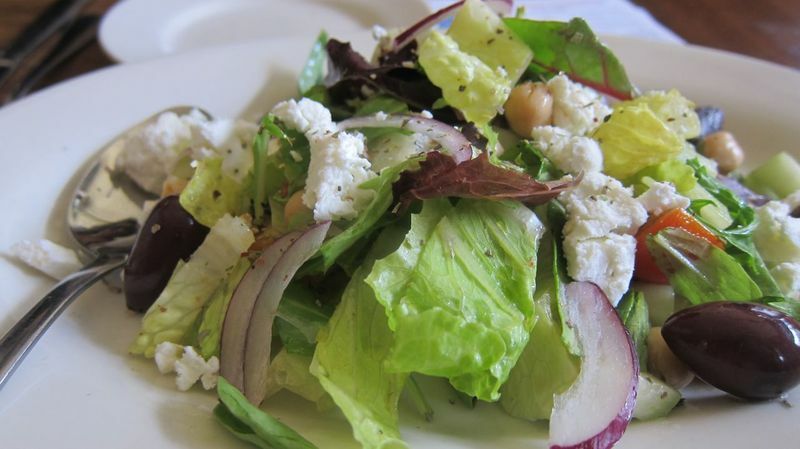 Romaine is tossed with cucumber, onions, chickpeas and goat cheese in the Insalata Mediterranea. I put together friends for lunch the next day to taste more and be sure. I can’t bring myself to order grilled chicken paillard or the stuffed chicken roll, two of four perfunctory entrées. What I really craved was the pastas we missed the night before. 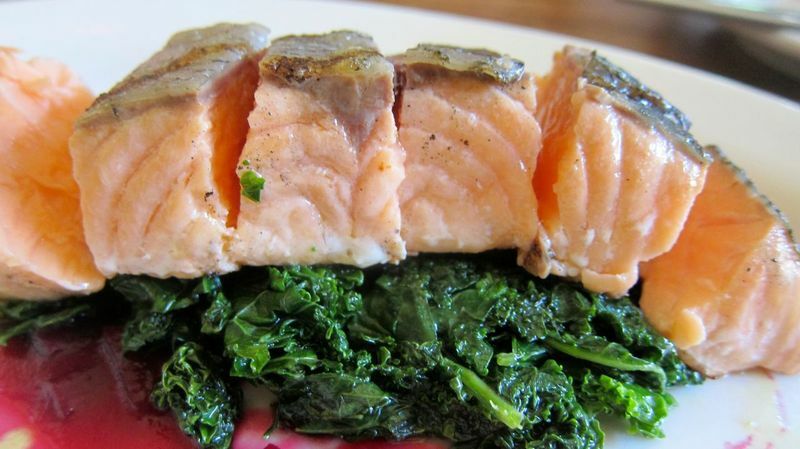 At lunch the next day, a cut of salmon at $17.50 is fresh and beautifully cooked. Francesca in a sleeveless red dress looks like she stepped out of a page in Vogue. She lets us order Gnocchi Montanara with a nod that suggests it’s not Sardinian. “It’s very good,” she allows. Cream does often work. 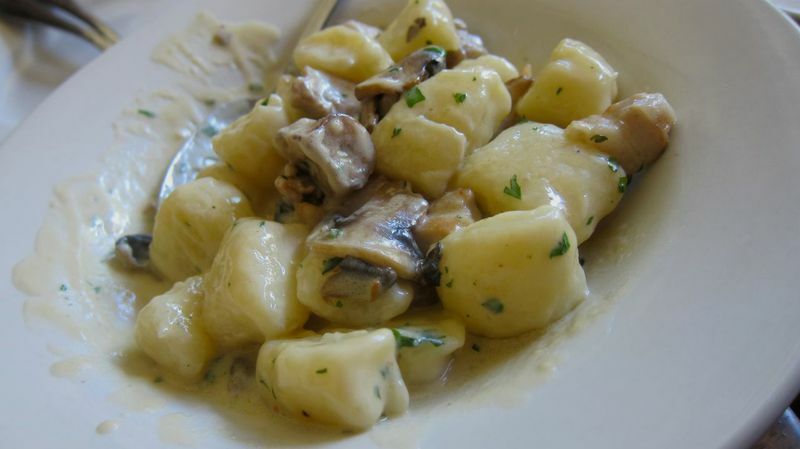 Here it coats bits of mushroom and pancetta on pillows of the house’s own voluptuous potato gnocchi. I’m not a fan of fregole pasta -- it reminds me of Israeli couscous which I don’t like either -- but here it has some character with whole baby octopus and mussels in a light tomato sauce. Housemade potato gnocchi Montanara with mushrooms and bacon get a marvelous cream glaze. The only miss is the special raviolacci chosen from the blackboard. The giant pasta squares encasing a small paunch of minced mushroom and ricotta are thick and tough. 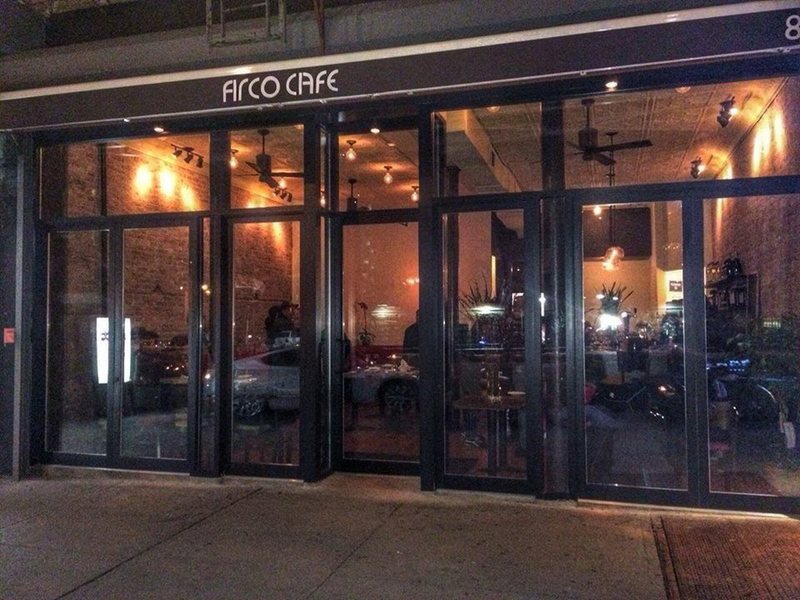 How will Arco Cafe evolve? I suspect Francesca would be a star in any dining room. But perhaps these rustic pastas are a special taste. Surely there are reluctant gourmands unwilling to venture north of 86th Street and some who never go this far west. Students from Columbia and locals can stake a claim. I fantasize discovering this team in a small café in Nouro, hometown of the Fioris. The dislocation lets me imagine I have wandered by accident into a small Sardinian café, in Nuoro maybe. That’s where Daniele and Francesca come from. Close your eyes to shut out the avocado green taxis streaking by and you’re there, too. 886 Amsterdam Avenue between 103rd and 104th Street. 212 665 0033. Monday to Thursday noon to 10:30 pm, Friday till 1. Saturday and Sunday 11 am to 11:30. 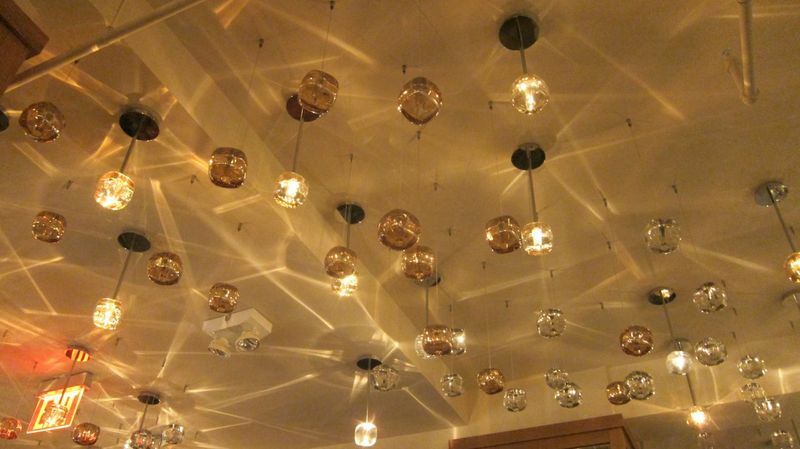 Look up to see some of the investment that has transformed Mickey Mantle’s into Villagio on the Park. Arco provokes a pleasanter mirage than engulfed me the night before when I didn’t need to click my sequined red shoes to imagine I was in Palm Beach. It’s not unusual for a sizzling New York concept to be cloned in Palm Beach. But why bring Villagio on the Park, a South Florida old world Italian restaurant, to Central Park West? Millions had been spent transforming Mickey Mantle’s into this vast gleaming gold-leafed stationary cruise ship. Transfusions of Grandeur. I can’t recall soggier stuffed squash blossoms ever. 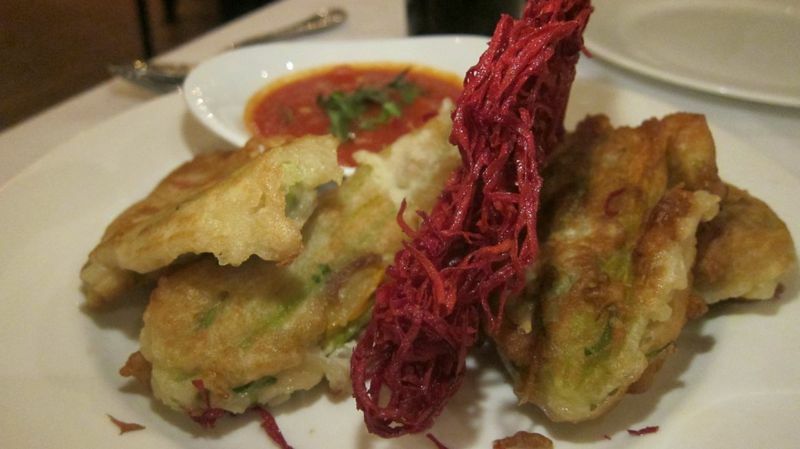 Dig the decorative mesh of fried beet strings. My companion and I debated the irrational boldness, as we contemplated the limp and flavorless focaccia from the oven and hapless zucchini blossoms stuffed into soggy cutlets with a decorative mesh of fried beet strings. Our limp linguine Selvaggio, buried in a lush compost of assorted mushrooms, sun-dried tomatoes, mozzarella and pecorino dust, never had a chance to be even slightly al dente. Here’s a nice mushroom-vegetable stew on limp linguine. When we saw the menu and the parade of tourists in sneakers and shorts, why didn’t we escape to the Plaza Food Hall or Marea. Perhaps it was end-of-a-busy-day inertia, perhaps a feeling of loyalty to our waiter, Roberto, imported to the city with a team of Florida servers, he confided. From the moment he scurried toward us, bringing black napkins to protect us from the lint factor of the white napkin at each place setting, he could not leave us alone. I mean, um..he could not do enough. When my pal muttered that his pollo di Carbone -- a mattress of chicken breast with another corsage of fried beet slivers -- was dry, Roberto seized the plate and whisked it away. I worry about Roberto, far from home, searching for a city rental he can afford even though the company has promised to subsidize it. 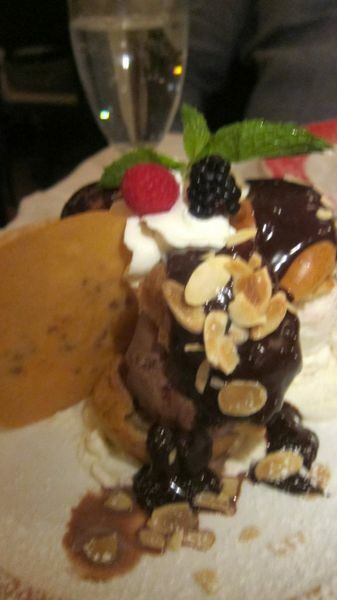 Finish off a huge profiterole without guilt if you've been fussy and barely tasted dinner. Maybe the bosses behind Villagio on the Park are smarter than snobs like us. Upscale hotels in this zip code surely house that class of visitor that craves fettucine dolce vita and tilapia Francese. When the rescued carriage horses finally go one day to that grassy field in the sky, there will always be the comfort of giant veal nodino here, and Roberto anticipating needs one didn’t know one needed. 40 Central Park South 212 369 4000. 11:30 am to 11 pm.